Almost everyone who has started high school has heard of the SAT. Whether you’re fully familiar with what the SAT is and does, or only know it by name, you’ve come to the right place for learning all about what this exam will entail! However, just in case you haven’t heard of the test, or don’t know much about it, we would like to introduce you to the basics of our SAT practice test. You can effectively think of the SAT as a de facto entrance exam for college. Before you can apply to most universities or colleges in the United States, you must first score well on either the SAT or ACT. However, the SAT is considerably more prominent. You generally won’t have to face this test until your senior year of high school, though you will have already gained a preview of how the SAT works in the form of the PSAT. 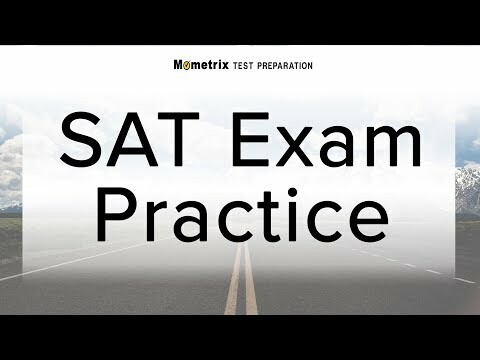 To get ready for the official SAT it is recommended that you take a practice SAT test. For the sake of those who may not be as familiar with the SAT and its structure, however, or are simply in search of more in-depth information, we will go over exactly what you can expect from this exam and give you some free SAT sample questions. The SAT divides into four sections, all of them based on the core subjects you’ve learned throughout your academic career. Three of them (reading, writing and language, and math) are mandatory, while the remaining one essay is mainly elective. All four of these subject tests will help you to demonstrate your mastery of the skills you’ll need to thrive in the university environment to your chosen colleges. In terms of format, the SAT test is similar to other standardized tests you’ve taken before. The majority of SAT practice questions on the test will be multiple choice. Naturally, the essay section will require the standard, five paragraph essay answer. Each portion of the exam is timed. You have 230 minutes (3 hours and 50 minutes) total to complete all four sections of the SAT test. There are 154 questions total. Because the SAT is meant to gauge college readiness, the content of each subtest will center around necessary skills within that particular subject. However, all of the exam’s content is based solely on the curriculum you’ve already learned throughout high school. Additionally, the developers of the test have sought to mirror practice SAT questions after scenarios you’ll find in your day to day life, all for the sake of making the test more accessible to you. Make sure you are familiar with the style of SAT prep questions before taking the test. The SAT’s Mathematics section contains 58 questions that you must complete in 80 minutes. It is a bit different from what you may be used to. It has been retooled to be less abstract, and instead will draw from principles and concepts you may have already encountered or will come across in normal life. In other words, the math featured on the SAT will closely mirror the same types of math you use on a regular basis, outside of class. As such, questions on this part of the exam are simpler, but not too simple. Many of the problems featured must be solved with the help of more than one mathematical concept or method. The Mathematics section of the exam is markedly different from the rest in several ways. First, this is the only area of the SAT where you will have access to a calculator. 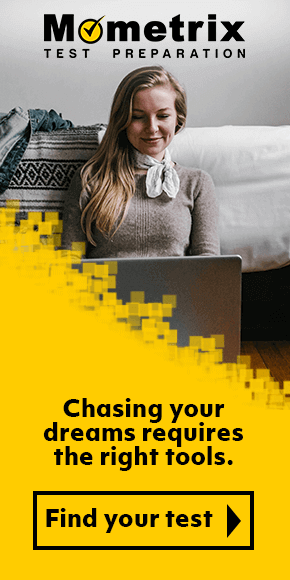 However, instead of simply allowing you to utilize your calculator whenever you like, the SAT aims to evaluate your ability to distinguish when you need the help of a calculator to solve a problem, and when you’re better off relying on mental math. As such, you will not be able to use a calculator on one half of the exam, but will be given full reign to use it on a separate half. The SAT Mathematics subject exam is also distinct in that it files its questions under two types of categories: three skill categories, and four knowledge categories. We will discuss the skill categories in more detail below. Applications focuses on the various processes you must utilize in order to find the right answer to a problem. You must know when to use certain methods, as well as how to execute them effectively. The Conceptual Understanding category involves the numerous elements you’ll come across in mathematical problems—such as graphs and functions—and how to make sense of them. Fluency effectively ties the above two concepts together. You will be expected to read problems and, based on the information presented, figure out how to approach them in the best possible way. The exam’s knowledge categories focus on the specific subjects you’ll need to recognize and understand in order to score well on the exam. These include Additional Topics in Math, Heart of Algebra, Passport to Advanced Math, and Problem Solving and Data Analysis. The Writing and Language section of the SAT is similar in format to the average reading exam, in that you will be asked to read short selections and respond to questions pertaining to them. You have 35 minutes to complete 44 questions or tasks. However, the aim of the test is quite different. Each reading selection featured on this part of the test will have some sort of mistake, be it in grammar, word choice, or a similar element. You will have to identify these errors and know how to fix them so they make grammatical sense. The ungrammatical parts of each selection will be underlined for you. Like the Mathematics section, the Writing and Language exam will cover its own set of skill categories. They are as follows. Standard English Conventions is based entirely on grammar rules. As such, this skill category will assess your understanding of such concepts as how to properly utilize commas, compose sentences, and similar concepts. The Command of Evidence skill category specifically focuses on how to build an assertion. It will test your ability to gauge whether a statement lends to the main idea of a reading selection. Expression of Ideas revolves around the composition of a written work. It will be up to you to decide whether the concepts included in a work are arranged in a way that makes sense. Analysis in History/Social Studies and in Science will involve passages with some level of scientific or historical significance. You will read these selections and polish them so as to strengthen their ideas. Words in Context will deal with how words affect the meaning of a work. You will be expected to render a statement more effective by selecting a word that matches its meaning. As stated above, the essay portion of the SAT is 100 percent elective. You will write one essay in 50 minutes. There’s no harm in not taking it—unless writing is one of your strong points, and something you’d like for your prospective universities to see. Mometrix doesn’t We don’t offer resources for the writing section. However, since it’s an important part of the exam for many, we would still like to give it some coverage here. The essay section of the SAT serves as a combination of both the writing and reading exams, presented in a format that’s completely different from the rest of the test. You will be presented with a reading selection. From this selection, you will then be expected to interpret it from a critical standpoint, studying the author’s intentions in writing the piece and how they construct and expand upon their main themes. The Reading section of the SAT will probably feel the most familiar to you. It works exactly like other standardized reading tests, in that you’ll be presented with an array of passages to read, then respond to questions regarding their content. There are 52 questions that you must answer in 65 minutes. However, the SAT will toss a variety of passages your way to gauge your comprehension of several types of reading material. You can officially expect to find two selections relating to basic science; one literature piece; one selection pertaining to social science; and a final selection pulled from a major historical document. You can expect to occasionally find two passages grouped together, which you must compare and contrast according to the questions presented. Each question featured on this part of the test will only pertain to the information within the selections, and won’t require any advanced understanding of the work. Furthermore, the Reading subtest will expect you to not only be able to understand the content of each passage on a surface level, but also utilize your critical reading skills to decipher what the passage means and how it conveys that meaning to readers. Like the other sections of the exam, the Reading subtest covers three specific skills, all of which you have utilized throughout high school and will continue to use once you graduate. We will address each of these skills below. Analysis in History/Social Studies and in Science concentrates on the more specialized reading selections you will encounter on this part of the exam. You will have to read and interpret each work and their respective questions according their subjects. This skill category will involve many of the same tools you use throughout your science and history classes, but all questions will be kept within the context of the work itself. Words in Context deals with words and what they mean, especially in reference to the themes and message of a written work. For questions under this skill category, you will have to examine specific words within a reading selection and infer the influence it has on the work, including why it may have been used in place of other words; and define terms based on their place in the passage. Command of Evidence will focus on how well you can distinguish evidence within a written work, using what is written to deduce how it relates to the work’s assertion. Questions for this skill will often require you to compare a reading selection with a pictorial data; recognize the ways writers strengthen their arguments through evidence; and make inferences using information pulled directly from the reading. Our practice test provides you with a more hands-on approach to your studies. Many test takers hate running into surprises on exam day. By using our practice test, you can gain a deeper understanding of the test’s inner workings and what sort of content it will feature. In turn, you will also come to know which areas of the test you may need to devote more focus to throughout your studies, as well as how to approach the exam as a whole. Our prep classes provide the best of both worlds! They will go over every piece of the exam in-depth to help deepen your understanding of it. Best of all, you can access all of these study tools from the comfort of your room! If you’re on the lookout for the ultimate set of resources to help you score as best you can on the SAT, look no further than us. We’re here to help you any time you need. The Mometrix Test Preparation team is 100 percent dedicated to helping you succeed! We want to give you resources you can rely on. That’s why we strive to offer you the only the best and most comprehensive tools to aid you in your study efforts. On this page, you can gain access to the various study tools we’ve composed specifically for the SAT. You’ll find our study guide, practice test, and preparatory course through the links above. Each of these tools were devised through careful and thorough observation of the SAT. They should give you a complete glimpse of how the exam works. 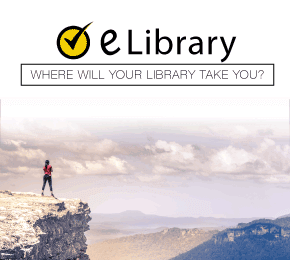 Our study guide is ideal for those who aren’t quite sure where to start with their study efforts, or find themselves stuck and don’t know where to go next. It is designed to give you in-depth direction on the most effective study strategies for the SAT. Mometrix Academy is a completely free resource provided by Mometrix Test Preparation. If you find benefit from our efforts here, check out our premium quality SAT study guide to take your studying to the next level. Just click the SAT study guide link below. Your purchase also helps us make even more great, free content for test-takers. 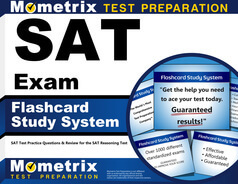 Our customers love the tutorial videos from Mometrix Academy that we have incorporated into our SAT study guide. The SAT study guide reviews below are examples of customer experiences. Having glance through the book which was recommended by a colleague I know this is the right book for my daughter’s preparation of the SAT. SAT Secrets Study Guide – Having glance through the book which was recommended by a colleague I know this is the right book for my daughter’s preparation of the SAT. Definitely deserves 5 stars for its great explanations, advice, and teachings; this also happens to be a NEW SAT study guide for the redesigned test. This redesigned test has a new format, new styles and designs of questions, and new topics covered- thus making this the perfect study guide to read to become aware of the changes and what is now expected. My daughter is a Junior in High School so it’s becoming that time of year when (for our particular school district) she is preparing to take her college entrance exams. This SAT prep book is an excellent resource! It is written well and cuts right to the necessary topics, focusing on what is covered on the test and leaving out the frills and stays on-topic. I especially like that it includes the SAT practice tests so you can concentrate on your most weakest areas before the real test. This book also does a great job at providing tips and tricks on the approach to figure out the correct answer of the options if you are unsure. If you or someone you know will be taking this test this is a book I would definitely recommend as reference material for studying, it is worth the money! This book is a must have if you’re studying for the SAT! It is well written and not only gives you practice but helps you with different strategies to try to get the correct answer. I would definitely recommend this book! I gave this book to my friend who is preparing for the SAT. This book is great because it provides practice problems with solutions, practice test, and walk through examples that help you understand what the questions are asking. I highly recommend this product for any soon to be college student that is practicing for the SAT. This is an awesome book for SAT preparation. My sister uses it on a daily basis to prepare for her SATs in March. It has very comprehensive explanations and gets down to the point. Bought this for my son, who is a junior. He needed something that wasn’t overwhelming, easy to follow and comprehend. This fit the bill completely. It’s well laid out, appropriate reading level and jargon, well suited for his age and abilities. Sample questions are helpful and plentiful. I find this to be a great study tool and prep for anyone looking to take the SATs.